The Rose City Park neighborhood was platted in 1907, the year of the first Portland Rose Festival. Trolley service from Downtown Portland was inaugurated that year by the Portland Railway, Light & Power Co., and discontinued November 30, 1936. 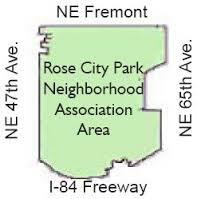 In addition to its eponymous park (acquired 1920), other parks in the neighborhood include Normandale Park (1940), Frazer Park (1950, on the site of a former juvenile detention center), and the western part of Rose City Golf Course (1920), whose clubhouse was listed on the National Register of Historic Places in 2012. A statue of George Washington was commissioned by Henry Waldo Coe and sculpted by Pompeo Coppini, and dedicated on July 4, 1927. It stands at 57th Avenue and Sandy Boulevard, in the center of the neighborhood. Beginning in March 1946, NABISCO proposed building a large factory on 24 acres (97,000 m2) in the Rose City Park neighborhood, choosing the location for proximity of workers and access to the rail line. The city council approved the zoning change on June 5, 1947, but by June 26, 1947 NABISCO abandoned the project, building a plant at the northern edge of the Piedmont neighborhood on Columbia Boulevard. The plant was completed in August 1950. The award, named after longtime RCPNA Chair George M. Walker and his wife Esther, is given annually by the RCPNA Board to recognize a member of the neighborhood for their outstanding service to the community. Editor’s Note: More neighborhood history coming soon!